In the early 1960's this small book was written by A. K. Sanyal (Pranab) about Baba's life. The language Pranab uses may seem somewhat odd, but to me, on my first visit to West Bengal, it was filled with mystery and amazement. 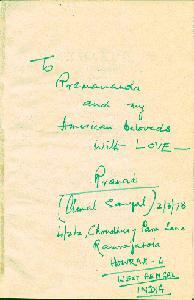 First of all Pranab writes in the first person as if it were Baba speaking. Secondly, English was a second or third language to him and clearly had to make heavy use of the Bengali-English dictionaries which, even today are often vague and confused. A given English word will have many meanings listed. But even though it takes a while to get used to the strange style, the book gives us a peek into the unusual story of Baba's life. Even today it remains the only book ever published about Baba. Now, thirty-five years after it was written, we are happy that it can be offered to everyone, as it was meant to be. 1. "The elder amongst the two sisters.." Pictured is Pranab's sister Keya to whom happened the strange events described by Pranab. She was known to all the devotees as "Thakur Ma." She was the one person to whom Baba always greeted with a full pranam. 2. "I found in my front a Sanyasin.." The full strangeness and wonder of this incident was far more evident when we heard Baba tell it to us in his own words. In fact, if he began telling the story he could usually not finish it for he would begin weeping and eventually go into samadhi just thinking of it. Who or what this being was whom Baba called "guru" we shall probably never know. See also the account of this night in Baba's own words. 3. "..one foot long.." Baba showed me this "log." In reality it was about 5 inches long and small enough to hold in one's hand. He carried it always when he traveled in a small bag with a few other treasures. It was worn incredibly smooth with age and handling and showed marks where tiny pieces had been chipped off, no doubt for various unknown purposes. I have heard stories of healings where Baba gave a piece of it to a sick person to eat. 4. "The third display.." Baba showed us the scar upon his tongue from this incident. The matter of the juice from the leaves is very curious. Was this a plant related to the ancient "Soma" of the Vedas? When Baba recounted this experience in his inimical way it was impossible for the western devotees who came of age in the 1960's not to think that this had been some kind of psychelic plant. 5. "...our deitys room" Baba took me to his father's house in Purushottampur, Orissa, where I photographed him doing his worship in this very room. See one of these pictures here.